(Oakland, CA) Legendary hip-hop collective Hieroglyphics Imperium and Linden Street Brewery are proud to announce a partial line-up of performers for the 2nd Annual Hiero Day, which will take place on Monday, September 2, 2013 (Labor Day) from 10:30 a.m. – 6:00 p.m. at Linden Street Brewery, located at the Port of Oakland. 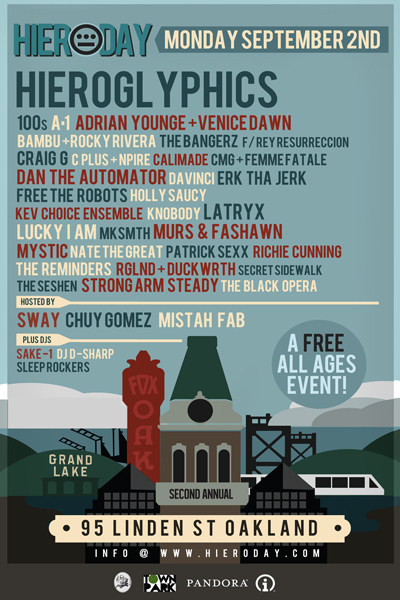 Hiero Day, a free, all-day all-ages music festival, will feature live performances by The Hieroglyphics, Strong Arm Steady, Latyrx, The Seshen, Fashawn, The Reminders, Free The Robots, The Black Opera, Adrian Younge and Venice Dawn, Craig G, Sake One, DJ DSharp, The Kev Choice Ensemble with hosts Chuy Gomez, Mistah F.A.B., and others to be announced. Confirmed merchandise and food vendors include local favorites Oaklandish, Romper Clothing, Babylon Art Movement, Fist of Flour, The Stroopie Gourmet, Boffo Cart, Lima Peruvian, Me So Hungry, Endless Summer Sweets, and The Giant Peach and many more. Interactive activities for all ages include a skate park presented by Town Park, face painting, chess tournaments, along with a family friendly area. Event organizers encourage attendees to help promote a green event and reduce waste by bringing their own water bottles to fill up at water stations at the event. Public transportation is highly encouraged, as parking is extremely limited, and the San Francisco Bay Bridge will be closed, therefore we encourage BART, the ferry and bikes. Early arrival is encouraged as capacity is limited. Hiero Day celebrates and showcases the Bay Area’s diverse, innovative, multicultural, and multigenerational music movement in the heart of Oakland. This year’s festival holds particular significance to the local music community, as it lands on the 20th anniversary of the release of the highly influential and groundbreaking album, 93′ Til Infinity by Hieroglyphics founding members, Souls of Mischief. Visit www.hieroday.com for more information, as well as updates on performances, sponsorship and volunteer opportunities, and festival activities. Contact Michelle or Dan if interested in speaking with any Hiero Imperium artists. Contact Veronica Webber for sponsorship opportunities, vendor information, and performance bookings. Hieroglyphics Imperium is pleased to partner with the Linden Street Brewery and many other sponsors and supporters for Hiero Day 2013, including Pandora, Solstice, 40Radio, TuneIn Radio, and PK Sound, Inc. The Brewery will prepare a special “Hiero Beer” exclusive for the event. Several downtown Oakland businesses, including Tribune Tavern, Camber, Lungomare and more will host special Hiero Day “After Parties” following the festival. Hieroglyphics, an Oakland-based underground hip-hop collective founded in the early 1990’s, is composed of rappers Del the Funky Homosapien, Casual, Pep Love, Domino, DJ Touré, and Souls of Mischief members A-Plus, Phesto, Opio, and Tajai. After releasing several albums on major labels, in 1997 they created their own indie empire, Hieroglyphics Imperium, and have been an influential force in the independent music scene ever since. Since its inception, the Heiro Crew has thrived, releasing several albums and collaborating with a laundry list of popular and independent artists, including The Gorillaz, Q-Tip, George Clinton, Jurassic 5, Bill Ortiz, Dilated Peoples, Dan The Automator, Prince Paul, Xzibit, and more.